This post is written by Amy Zoellner, events manager for Experience Columbus. It’s finally March…and with it comes MARCH MADNESS! We in Columbus have been trying to recover from the heartbreaking, first-round loss of our beloved Buckeyes in the NCAA Mens Basketball Tournament. But we&apos;ve gotten over the initial shock and have enjoyed watching our neighbors in Dayton on their tournament run! 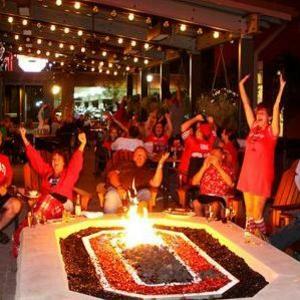 The Sweet Sixteen is full of underdogs and powerhouses alike and with the tournament resuming this Thursday, I’d like to tell you about some of my favorite places to catch a game in Columbus. If you’re into watching multiple games at the same time, you can’t miss the o.h. sports bar at the Hollywood Casino Columbus. With an endless display of big (we’re talking huge!) screen TVs, you’ll never miss a second of the action! Don’t miss out on Thursday Happy Hour from 4-9 p.m. featuring $2.50 drafts, $5 martinis and $5 appetizers. If you enjoy talking about the big game with new friends, head on over to Marshall&apos;s in Grandview. This small, neighborhood bar knows how to pack in the people, so get there early and enjoy some of their delicious appetizers and daily drink specials. 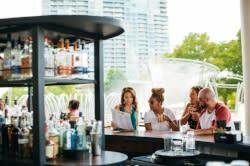 You will quickly make friends with the folks at table next to you and the sports fanatics at the bar who sit at the edge of their seats from the moment the ball is tipped. The excellent wait staff and personable bartenders are the icing on this sports bar cake! If you are a Buckeye faithful, you can never go wrong with Buckeye Hall of Fame Grill. With over 40 big-screen televisions, there isn’t a bad seat in this house. During the commercial breaks, walk around and see all of the unique and exclusive Buckeye memorabilia. There is something nostalgic on every wall! During March Madness, BHOFG has pitchers of beer and Grilled Chicken Nachos for $11.99. If you like a big beer selection for the big game, stop in any of Columbus’ Winking Lizard Taverns. Winking Lizard’s Tour of Beers boasts 323 beers. The only problem you’ll have is choosing which ones to try! Winking Lizard offers a large variety of big-screens and boisterous, beer-drinking fans that are just about as entertaining as the game! A large menu with something for everyone makes it worth checking out and with three locations in Columbus, there’s one close to home. So here’s to the best, the worst and the “One Shining Moment” this tournament season!